Thanks for library, it has been brilliant. I’m trying to connect to two devices to two separate USB ports. – Device ID 1002 is connected to the serial port I need to transmit to. – Device ID 2002 is connected to a serial device I need to monitor. How do I connect to two serial ports using your library? I would like to give it a try soon. Thanks. I’m not sure how to implement that. I’ve been trying to set up two connections & serial ports but get lost in threading. Do I put the constructor in usbservice and call it from where? Things related with UsbSerial always in a Service. It is a good pattern. I keep getting Usb Device Not Supported messages when attempting to connect to either an FTDI or a Prolific PL2303TA. Both of these work with DroidTerm. Doesn’t DroidTerm use the same serialtousb library? Yes, it should work. I just added some changes right now to SerialPortExample because I spotted an error with CDC in the library UsbSerial some days ago. Hope it helps! I have the same problem with DroidTerm and SerialPortExample. I have a device(CP2102) that continuously produces data packages and when socket is connected app starts to receive packages, but after 2-3 seconds of transfer window stops to indicate any process, the program stops responding to any clicks and there appears a message with information that program is not responding. (Prestigio pmp3007c3g, Android 4.2.2) Can you advise something? I am not sure about what is the problem but we are going to try something. I’ve updated SerialPortExample with a new version of UsbSerial that will force 4.2.2 devices to use the synchronous api (less buggy on lower Android versions). Give it a try please. Any chance you’d release an .apk of this sample app? I used android studio to import the project. I finally got it but my CP210xx only gives the first few lines of print. I tried a different arduino sketch and it was better but the printed text was binary hex looking and it too seemed to stop. Baud rates match. What is needed to keep the data flowing? I want to send the data to android and have an app read it and react to the data. I was hoping this example would lead the way. Its cool just to connect at all but I want more of course. The data should flow perfectly. Give it a try with DroidTerm and if the issue is still there maybe there is some problem with the arduino sketch. OK, thanks. I tried DroidTerm and the data flows great with each newline from the arduino.getting displayed. The example would fill the white box and then not show any new data. What I’m trying to do is port a Processing sketch that reads serial and then uses the data to draw a box that rotates according to roll, pitch, yaw. I tried a different library and it just crashes the processing sketch on android. 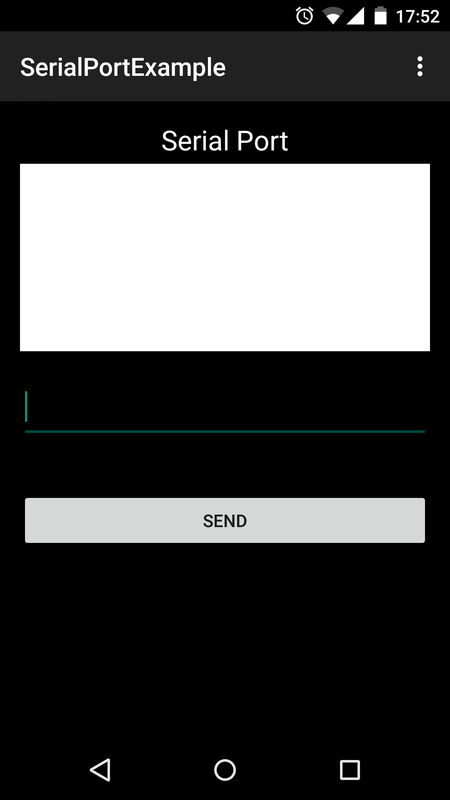 Take out the serial and the sketch works on android. Just need serial, but its a high hurdle. Hi , Great work on the UsbSerial. I tried on my LG G3 phone and its works using DroidTerm . I tried DriodTerm and it works great. But the usb serial example doesnt work with the same enviroment. I don’t know the language enough but it’d be nice to use something that keeps display.append(data) going. Here I am again. I have a MainActivity that uses your code to start the USB connection, I get the toast messages, and I have a fragment that is a PApplet. I have no clue how to get the MyHandler to send the msg.obj to my fragment as a string. I’ve tried a lot of crazy stuff like changing the handleMessage to a String and then returning msg.obj, but cant change the type from void. I would pay you just to clue me in if interested. Yippee, I got it. I use your code to read my arduino on the USB and my code to get my data from the main activity, then my processing code uses it to draw a cube that mimics the orientation of the arduino/sensors. It’s pretty cool to do that on a tablet. Thank you for the code. I stand on the shoulders of a giant. I have built an App using your library and usbService. When I rotate the device several times, the UsbService will rebuilt for the first two times. Then the UsbService cannot find the usb serial device. I tried to unbind and and rebind the service, however, it doesn’t help. I dont even get the cdc control messages. Neither do I know if the problem occurs due to your usbservice or the device nor I can isolate the problem further. Is there a changelog for your recent changes? I have been building the app since september 2015 using an old version from beginning 2015. I was trying to communicate to a windows or Linux PC USB instead of arduino. I did modify the device ID to 0x16b9 etc however I can’t see any data being received at the PC end through putty com port connection. I would be highly grateful if you could help. i am trying to connect a FTDI USB Serial Chip to Android. For my project it is important, that the communication works without the main app. So if the App is closed all should work like before, when the App was open. How can i implement this? I think a service. But Service maybe killed by android after some time? It is also important to recognize a serial event immediately within milliseconds. Do you have any idea on that? UsbSerial is pretty fast recognizing events but keep in mind that because Android limitations (Dalvik VM -> libusb library) it wont be as fast as a custom kernel driver. I now created a foregroundservice with notification…Is it possible to make a runnable in this service which continuously checks for new serial data? Or is there any trigger event, when serial data is availible to start a service which handle the input and after that stops itself? I am trying to communicate with CDC device using examplesync, it is able to read eventful data generated by CDC device, but sending request/command using send button click to CDC device doesnt return any response (valid or error). However using DroidTerm I am able to receive data as well as send request. While using DroidTerm adding any request in blue area(terminal) and tapping of enter key CDC device returns valid response. Do I need to take care on which line I am send the instructions and data respectively. Please suggest. App is open because i have device filter USB attached. Can create a connection and open it. Could somebody help me on this? hope this page support is live. how can I use this best serial communication on internet in unity3d android game. we have a game and want to send some data over serial port to arduino. In spite of a big variety of such apps on the GitHub, this example is the ONLY ONE which I managed to build and it runs great. Thank you for sharing.